Aluminum awnings are great for use on residential and commercial properties. Not only is their durability unparalleled, but aluminum awnings are also attractive and come in a wide variety of colors and styles to suit each property. There are great benefits to choosing aluminum awnings over various other materials. Here are just a few facts that make aluminum awnings a superior choice for your home or business. Aluminum awnings can cut energy costs. Aluminum awnings can reduce the absorption of heat into homes and commercial buildings. They contain layers of insulation that keep properties cooler in the summer heat. Aluminum awnings provide the property with shaded areas surrounding the windows, that can be up to twenty degrees cooler than the sunny spots. Aluminum awnings are easy to care for. Home and business owners are always looking for awnings that are easy to maintain. This is especially important to the look and general aesthetics of the property. Aluminum awnings are relatively easy to care for; a quick rinse with a hose will help tremendously in keeping away dirt and debris. If you have a lot of trees around your awnings, you will do yourself a favor by keeping them clipped and pruned when needed. They are far more durable than fabric awnings. The durability of aluminum awnings far outreaches that of fabric awnings. Fabric suffers from the effects of the weather; rain, sleet, snow, and high winds can eventually degrade the quality of a fabric awning. Aluminum is a material made to withstand bad weather and high winds. To give you a good example of the durability factor; fabric awnings are known to last anywhere from 10-15 years, while aluminum awnings can last up to 40 years before they would need to be replaced. 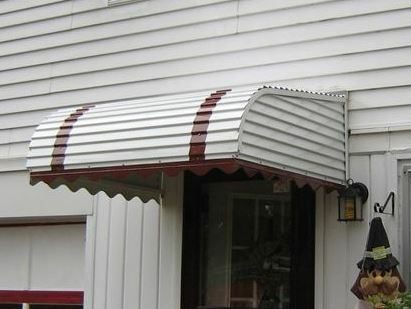 One of the best benefits of choosing aluminum awnings, is that they are engineered for year-round use. They can be enjoyed in areas that experience the changes of all four seasons; keeping the home cooler in the warm seasons, and the windows protected in the snowy and treacherous weather of winter.